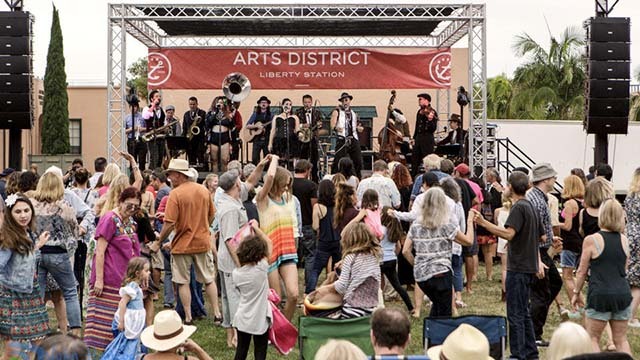 Arts District Liberty Station has announced a free concert series for its second year, featuring San Diego Music Awards winners and nominees. The four 5 p.m. concerts — outdoors on the grassy North Promenade on Sunday evenings — will feature a collection of popular San Diego musicians and acts. Produced in partnership with Damian DeRobbio — of Beer, Food & Music — the venue is set up to allow room to dance and get close to the acts, organizers said. The 2018 Liberty Station Concert series presents notable San Diego Music Awards winners and nominees, including Rebecca Jade, winner for Best Jazz Album with Peter Sprague; Birdy Bardot, winner for Best Pop; Earl Thomas, a former four-time SDMA winner; and Casey Hensley Band, nominated for Artist of the Year. Sponsorship opportunities from $5,000 to $1,500 are available through the Foundation. Concerts are held at 2848 Dewey Road — between Stone Brewing World Bistro and the Greetings mural. This eclectic, music theatre production celebrates all things crazy, magnificent and fun! The Six String Society mixes theater and multimedia with some of the finest performers around. Each show is unique. This special Liberty Station edition will break new ground and feature the amazing Nathan James, Whitney Shay, Casey Hensley, Billy Watson and Sharifah Muhammed. This act will deliver body-moving grooves to its brand of beach city soul, paying homage to the pioneers of the genre while adding vintage West Coast textures and psychedelic overtones. Whether digging down into gritty funk or lifting the roof on some high-octane gospel, the Cold Fact’s deft musicianship proves the ideal complement to Jade’s powerhouse performances. She glides smoothly between sultry sweetness and diva brass, conscientious of each song’s feel with every syllable and every purposeful breath. Earl Thomas will ignite audiences and bring rock and roll, R&B and blues to the ARTS DISTRICT. The two-time Grammy Award-nominated artist has won four times at the San Diego Music Awards! Also a songwriter, his songs have been covered by Tom Jones, Etta James and Screamin’ Jay Hawkins. The Redwoods, a local independent record label and music collective, will create a show from its growing list of talented artists. From hard-hitting soul and swampy psychedelic rock to desert noir and spectral folk, the label brings together songwriters, musicians and vocalists of the highest caliber, with a shared purpose to strive for a new standard for musical collaboration and song craft.